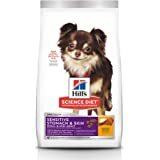 Amazon's Choice for "hills science diet dog food"
Hill's formulates unique foods for each age and specialty formulas for specific needs. 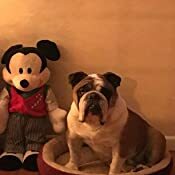 Your grown dog wants to feel as good as he or she looks. Hill's Science Diet Sensitive Stomach & Skin Adult Dog Food is specially formulated for optimal digestive health. 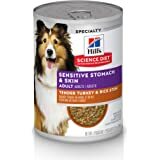 This dog food for sensitive stomachs uses prebiotic fiber to fuel gut bacteria and support a balanced microbiome. 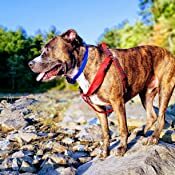 In addition, this dry dog food made with natural ingredients also provides an excellent source of vitamin E and Omega-6 fatty acids to nourish your dog's skin, and help maintain a healthy, shiny coat. 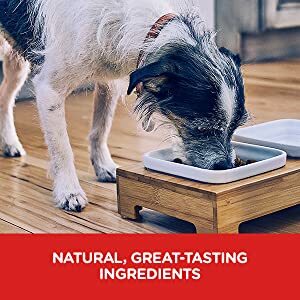 This digestion care food is formulated with decades of cutting-edge research to be a great-tasting meal adult dogs can truly enjoy. There’s more to love with the new look of Science Diet . 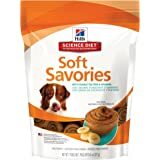 Some of our products also have new names, new kibble shapes & new formulas. More than 220 veterinarians, food scientists, technicians and Ph.D. nutritionists at Hill's develop all of Hill's pet foods to meet the needs of your pets. 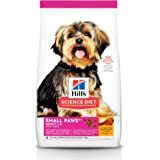 Hill’s only accepts ingredients from suppliers whose facilities meet stringent quality standards and who are approved by Hill's. 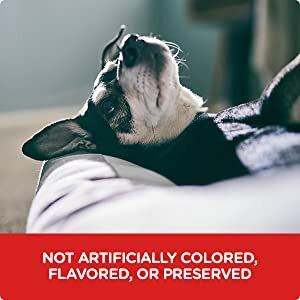 Not only is each ingredient examined to ensure its safety, we also analyze each product's ingredient profile for essential nutrients to ensure your pet gets the stringent, precise formulation they need. 5.0 out of 5 starsSolved all problems from my three boxers; yes!!!!! 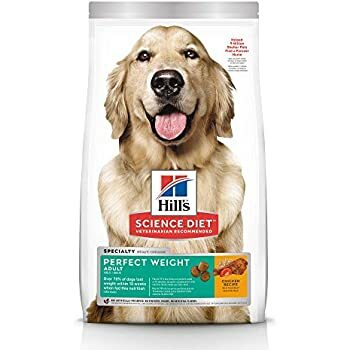 Let me start by saying I was one of the worst offenders for being 100% against my dogs eating Hill's Science Diet. 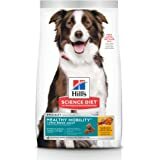 I was told that it contained lots of toxic chemicals and was only pushed on consumers by vets because they were paid by Hill's to push the product. My opinion has since changed since using this product. I have three boxers. One is in perfect health, the other suffers from terrible skin allergies, and the last has a very sensitive stomach due a stomach flip he had surgery for when his previous owners fed him a sock with food on it to try and kill him -- because of this, he has terrible farts. Since I've been using this product (close to a month now), my allergy dog no longer scratches herself all day and my little tooter dog no longer farts. I am literally amazed. We tried everything from Taste of the Wild, Blue Buffalo, Royal Canin, Nutrish, etc. 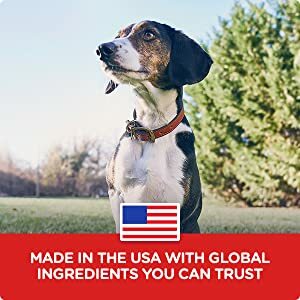 and nothing has worked for out dogs but this product. I cannot even begin to say how thankful I am we tried this food. 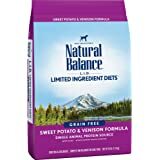 While I understand all vets have different opinions, but vet advised my husband and I to steer clear of "grain-free" foods. 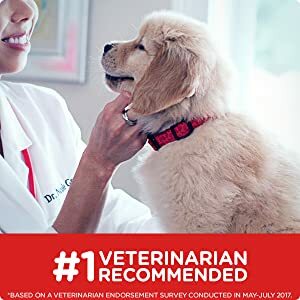 This really surprised me, because I always thought that they would be healthier for my pups and would prolong their life. Apparently, this is not the case. 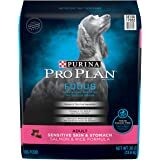 Through extensive research, they are finding that these types of foods are actually limiting the life of pup's due to the higher fat contents, which in turn wears down their heart much quicker (apologies if I didn't explain this correctly; trying to parrot what my vet said). 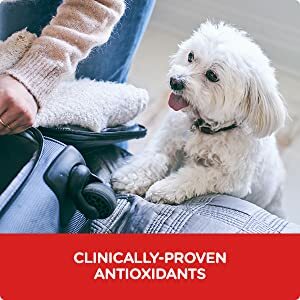 Moving forward, I'll be using this product and would not hesitate to recommend it to other pet owners who experience the same issues with their pups as I do. My dog has pretty severe allergies: general itching all over, very itchy paws (especially back ones) that she would lick and bite at until they were red, frequent yeast growth and severe ear infections (got so bad once that it emitted a horrible odor that smelled like sour milk) in one or both ears, rubbing her face on the ground, and just general discomfort. 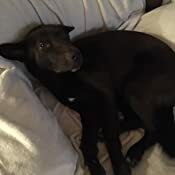 Because the allergies were so severe, and they could literally be caused by one or any number of things, I was NOT looking forward to potentially embarking on a extremely time consuming and expensive wild goose chase to figure out what was causing her allergies. Additionally, I was concerned about how long she would have to continue to suffer until I could figure it out. I really didn't know where to start with narrowing things down, and then someone suggested to try switching her food out - that's the easiest and least expensive thing to do. 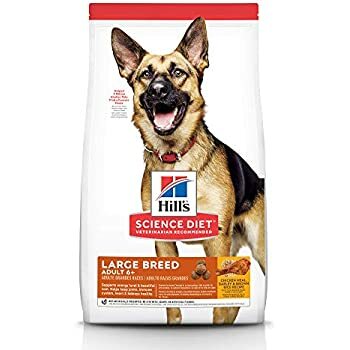 I know Science Diet is heralded a very good brand on the less expensive side of the "good dog foods" out there, so it was worth a shot. Before ordering, I called Amazon to see what their return/refund policy on foodstuffs was, in the event that my dog either didn't like the food or that it did not help with her allergies. Amazon customer service informed me that if I didn't like the product for any reason and I notified them within 30 days, they would refund the money and I would NOT have to return the food. Perfect! 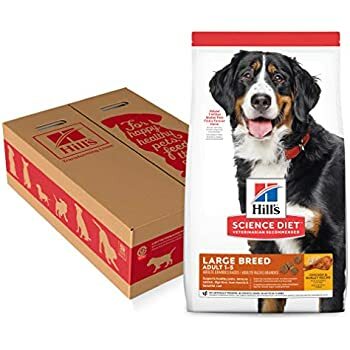 I ordered it and immediately started transiting my dog to this food. When she finally got transitioned to the point where she was eating mostly the Science Diet (about a week and half after I received the food), the majority of the allergy symptoms that she was experiencing basically disappeared. 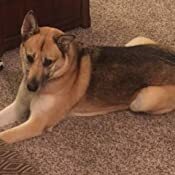 To date (approximately 1 month later), she has completely stopped obsessively scratching as well as licking and biting her paws. Even her ears cleared up a lot, although they still require weekly/bi-weekly cleaning. I AM SO GLAD THIS FOOD WORKED FOR HER. Additionally, I have found that this food is a lot more filling and she gets full at lot faster. She's not eating nearly as much (and thus not pooping as much), so I'm sure the food itself will last a lot longer! On the downside, I don't think she really cares for the taste. In fact, she started going on a partial food strike earlier this week (she could never just completely stop eating). But I explained to her that this isn't Burger King and you cannot have it your way. I also told her that she wasn't getting anymore treats until she eats her food like she is supposed to. She is now back to eating her food regularly. All in all, this food worked perfect for her! I can't say it will work for all dogs, but at least ordering from Amazon, you can get a refund if you find that it doesn't work. 5.0 out of 5 starsSolid poop, FINALLY! 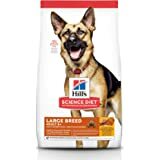 I have a 5 year old Doberman that has been eating Blue Buffalo for years since it's "the best" ... Or so they claim. Dobermans tend to have sensitive stomachs and mine is no exception. After browsing around Amazon and asking some people I decided to give Hill's a try and so far so good. 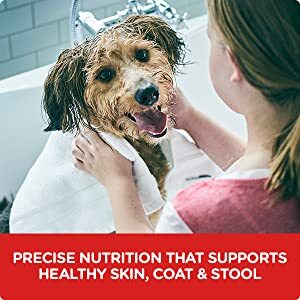 My dog finally has hard/solid poop!!! And she is excited to eat this food and actually chews it for once. I can't say much about the coat since it's still looks the same to me but definitely an improvement on the stomach issue. We are on our 3rd large bag right now. Will update in a few months and let you guys know if anything changes. I have a rescue small 10 lb dog. She was found on the streets of California, flown to Washington where we adopted her at 6 months old. She is frightened of absolutely everything, and eats just enough to stay alive. 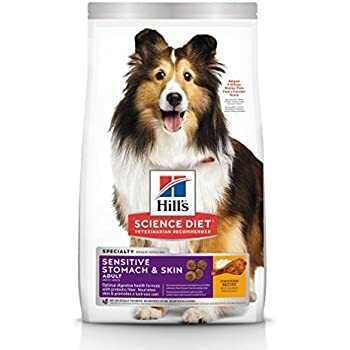 When I switched to Hill’s science diet, Tinna started to eat with excitement. I was shocked. 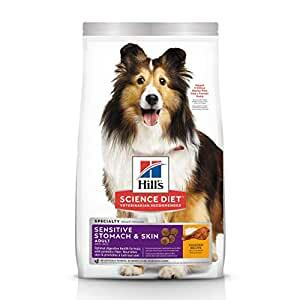 A friend of mine told me about adding Vitapet Omega Fish Oil Chewables with EPA and DHT for Dogs with CoQ10 and these chews have done wonders for Tinna. I have given her these the past 2 months & her coat is filling up nicely. This product really hit the spot for a couple of reasons. First, I live in Florida and my Lab gets "hot spots"off and on all summer long. Each trip to the vet is a couple hundred dollars because they give me only enough medicine for one round of treatment so the next month or so I am back again. Secondly, my Lab was shedding like crazy. His coat was dry and dull. When I petted him my hand would be full of hair and the floor would be covered. The other dog has much less hair but her coat was flaking. Third, both of the dogs were eating grass - they look more like cows grazing - and they were throwing up many times a day. 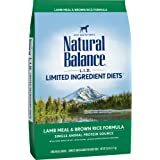 I tried several other dog foods without positive results. The vet wanted to do an exploratory operation on the Lab (but not the other dog??). 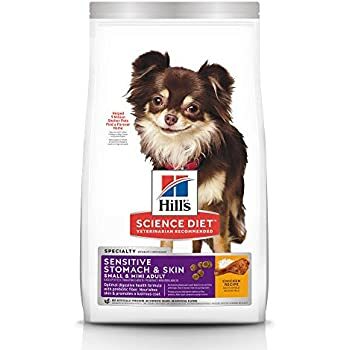 The pet store kept recommending dog foods predicated on price. 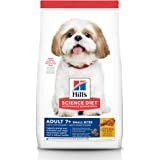 Finally, after several months, I bought Hill's Science Diet Adult Sensitive Stomach and Skin Dry Dog food and within 3 days the vomiting and grazing subsided. It took a bit longer for their coats to shine and the excessive shedding and flaking to stop.